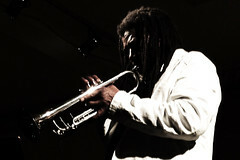 Fantastic trumpeter Wadada Leo Smith, a former Chicagoan and early member of the AACM, will make a rare local appearance on Friday night at the Goodspeed Recital Hall on the campus of the University of Chicago—he performs with reedist Douglas Ewart and drummer Mike Reed. This ad hoc configuration will improvise for the concert, but Smith is also an excellent composer—he’s been on a roll over the past couple years, with several meticulously conceived projects rooted in his own music, including the brand-new Ten Freedom Summers (Cuneiform), an ambitious four-CD set recorded with his long-running acoustic group the Golden Quartet (expanded to quintet on some tracks with a second drummer) and Los Angeles classical ensemble Southwest Chamber Music. When free jazz, multi-instrumentalist Vinny Golia first set foot in Los Angeles in the early 1970s he wasn’t expecting to stay. But circumstances dictated he was here for good, so Golia embarked on a project that helped him become one of the most important guardians of the more experimental pockets of West Coast jazz history. Thirty-five years later, his project of necessity, Nine Winds Records, is celebrating its unstoppable mission with a Wednesday night June residency at the Blue Whale. The self-taught woodwind genie has a sound that can bellow like a foghorn or squeak like a nest full of birds; it’s frenetic, unstoppable, and a far cry from what anyone might consider commercial. The genre-defying triumvirate of veteran keyboardist-composer Roy Powell, guitarist Jacob Young and drummer Jarle Vespestad, comes out blazing with a vengeance on InterStatic, their RareNoise Records debut and second release overall, following their ambitious 2011 outing, Anthem. Seamlessly combining elements of jazz, experimental, ambient and rock, the power trio stretches in typically intense fashion, extending the organ trio tradition established by Jimmy Smith and taken to realms beyond on such groundbreaking recordings as Tony Williams Lifetime’s Emergency! (with Larry Young and John McLaughlin) and John Abercrombie’s Timeless (with Jan Hammer and Jack DeJohnette). Launching a new album on FMR – Predicate is led by guitarist Alex Ward, “one of those musicians who seems to get interesting music out of anything he touches” (Nate Dorward). 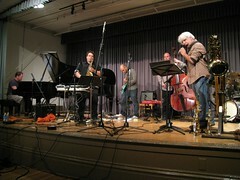 With Tim Hill (alto and baritone saxophones), Dominic Lash (double bass) and Mark Sanders (drums). From Spain – momentous speech that describes violence, landscapes and stories of a raw, joyful and at times sarcastic perspective on life. Rockpopjazz from Norway – led by bassist Ellen Andrea Wang. From Holland – seductive, funny, challenging, wicked. Great musical depth and strong rhythms – jazz in a new guise. Featuring Paula Matthusen, Tom Hamilton, Chris McIntyre’s Ullu (w/ Dave Shively), No Collective, John Zorn‘s Book of Heads (complete) performed by James Moore, Transient Series. Paula Matthusen premieres her new piece “Pendulum Studies” for extracted piano frame. Performed by Kathleen Supové and Wil Smith. Slybersonic Tromosome (Tom Hamilton – electronics Peter Zummo – trombone, electronics). The 19th anniversary of this band, with a few years off for good behavior. This duo’s trajectory – chronicled at midpoint by both the so-named 2000 Zummo/Hamilton Conference at Logos (Ghent) and their eponymous CD on Penumbra Records – has made a gradual descent into the later endnotes of New York’s creative life. Their previous 12th anniversary concert suggested more than it revealed while discovering paths never to be taken, trends to be refuted, unidirectional wires lost. And as always: Free reverb. Composer and multi-instrumentalist Chris McIntyre presents the debut performance of his new band project, UllU. This “preview” of the group is a collaborative duo iteration with the extraordinary percussionist David Shively (Either/Or). Also featured for part of the performance is special guest Eli Keszler also on percussion. The music of UllU is a percussive, “harmonic”, and textural mix of ideas; a dialectic investigation of pure and damaged symmetry, unified and polyvalent sonic images. Strategic and notated compositional material is used to create audible yet illusive formal structures. Rhythmic and linear content moves in and out of entrainment kaleidoscopically. The use of on-stage multi-channel amplification (outputting acoustic, synthesizer, sampler, and drum machine material) modulates the shifting dimensionality of UllU’s ensemble sound. Call for Audiences: No Collective premiers the third installment in their Concertos series, which will explore the notion of “density” in music performance. As with the previous two pieces, Concertos No.3 again requires the presence of an audience. You can be of any race, gender, age, or political inclination, but please be ready to perform as an audience: to sit silently and perceive attentively the events unrolling before your eyes and ears for an hour or so. If you’re interested in taking part in this unique experience, simply come to the venue on the instructed date/time. An entrance fee of 15 dollars is required, but any number of people (between 1 and 15) can be admitted for the same total price. If more than 105 people show up, audience members will be selected via an audition.